As Google Reader gets ready to join that big obsolete app store in the sky on July 1, RSS-addicts like myself are on the search for a suitable alternative. Previously, I test-drove the popular Feedly app and website for a week and found it to be a worthy Reader successor. For this go-around, I’ve spent some time with Pulse, an RSS-catcher that is heavy on design, but short on versatility. From all appearances, the Pulse team has placed far more resources into the mobile reader app than the Web version. I’ll jump into the mobile experience later, but readers who plan to spend any time perusing content on the Web will find Pulse wanting. 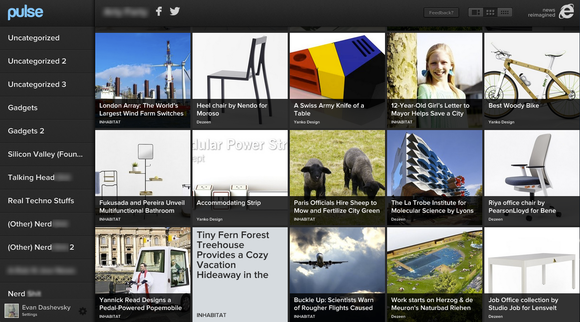 Like Feedly, Pulse allows users to automatically input their Reader feeds and subfolders. But unlike Feedly, Pulse adds an additional barrier by forcing you to sign up with an email/password or Facebook account. It’s not a serious issue, but it's an extra step. One of the few drawbacks of Feedly is that it occasionally gets deauthorized from my Google account (and my Reader preferences) following periods of inactivity. Pulse, however, kept me logged in until I signed out. Pulse is also more image-centric than Reader’s headline-focused display and was obviously designed with tablets and other touchscreen devices in mind. This isn’t inherently a bad thing. For casual users who have a limited number of feeds that they check only sporadically, this will probably suffice. But heavy content junkies like myself—those with a few hundred RSS feeds—will find in Pulse a lack of content mojo. An attractive, if not useful view. A major shortcoming of Pulse is its unfortunate lack of customization. 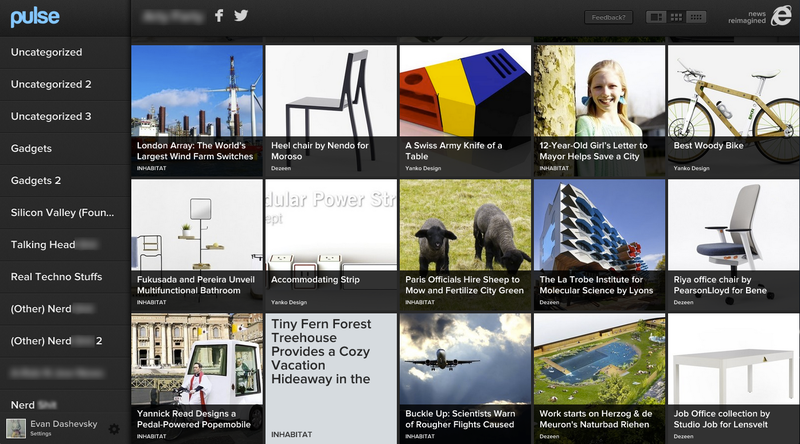 While Feedly offers a Reader-like minimalist headline experience in addition to its magazine displays, the Web version of Pulse only offers magazine displays. In fact, it only has three untitled viewing options featuring large image blocks, medium image blocks, or small image blocks. The platform is also not always able to import an image from every story (a bug on both the app and Web versions). Pulse’s story blocks appear to be in chronological order, but you can't see the date or time of when they were published until you click on the posts. There are a number of other frustrating shortcomings in Pulse that's unexcusable for heavy RSS junkies. First, Pulse maxes out at 12 feeds per any one subfolder. 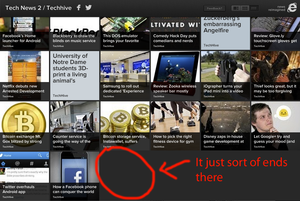 For example, in Reader I have a folder “Tech News” with 22 feeds. I know it had exactly 22 feeds because Pulse automatically separated the folder into two smaller folders: “Tech News” and “Tech News 2” with 12 and 10 feeds respectively. The same automated subdividing occurred with all my imported subfolders with more than a dozen feeds (which is most of them). Pulse has trouble looking back into content history. A big no-no. The other unfathomable aspect of Pulse is that it will (sometimes) max out and not draw back past features. Both Feedly and Reader have no problem reaching back infinitely. Most of the time, Pulse seemed to hit the wall at 25 stories for any specific feed. While some websites post less than 25 stories per day, many post far more. This seemingly arbitrary limit will simply not do for anyone serious about keeping tabs on his or her content. For the most part, I found Pulse in its Web form to be a poor Reader substitute. However, I will end on one compliment that even Feedly can learn from: Pulse has a stylish Chrome extension that will instantly throw any website you visit into your saved folder with a simple click and unobtrusive confirmation. If only they put as much resources into the rest of the product. The app version of Pulse (available on both iTunes and Google Play; sometimes branded as Pulse News), which I used on my Android phone, laid out long flat rows of blocked content that users can swipe along horizontally. As far as I can tell, this is the only viewing option. There are the same limits on feeds-per-subfolders and the same 25-post limit on posts-per-folder. Again, very annoying. 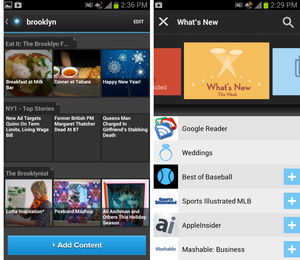 Overall, the Pulse team provided more content options in the mobile version. For example, the app allows you to link to various social feeds such as Instagram and YouTube. Twitter also feeds directly into the app. But the weird thing is that you don't seem to be able to access any of the content in the Web version, rendering the program useless for anyone looking for a multiplatform experience. While Pulse is not without some design strengths, it's far outshined by a more beefy and versatile RSS platform like Feedly. If you only want to follow a few websites and don't particularly care if you miss out on some content, Pulse may prove good enough. 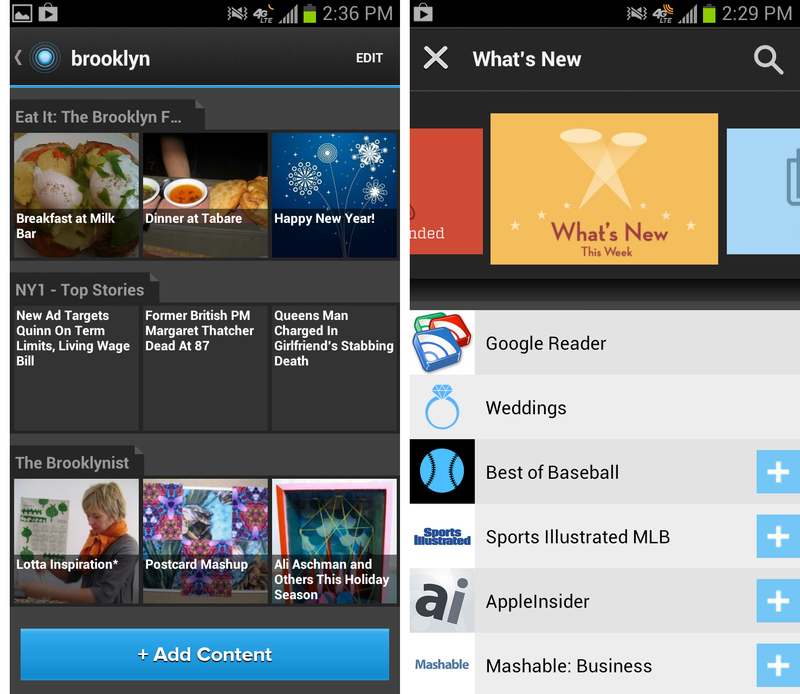 But for anyone who came from the Google Reader arena, Pulse is a poor substitute. This story, "A week with Pulse: A Google Reader junkie's journey" was originally published by TechHive. A stylish, if defiantly non-versatile RSS reader that will not be of use to people who are dependent on a steady stream of content.